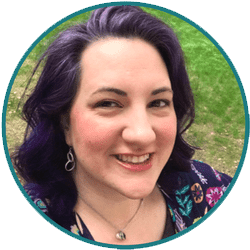 Just this week, a member of our Creative Green Living Community Group sent me a personal message asking about healthy lunchbox supplies that don't have sketchy chemicals like lead (yes, really! ), phthalates, PVC, etc. 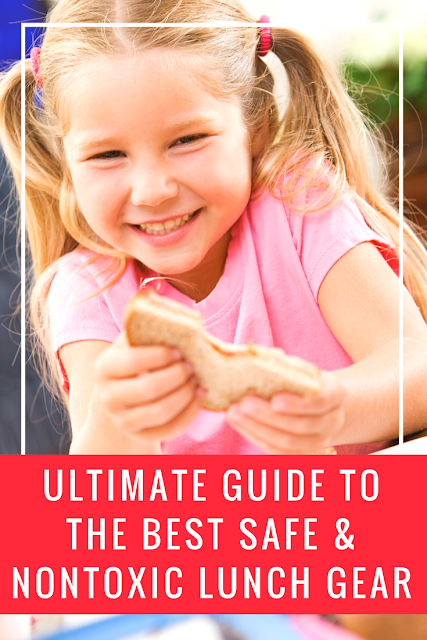 This is a pretty popular topic every year in August and September as families get ready for back-to-school shopping so I wanted to put together an easy guide with all of my lunch gear favorites in one space. 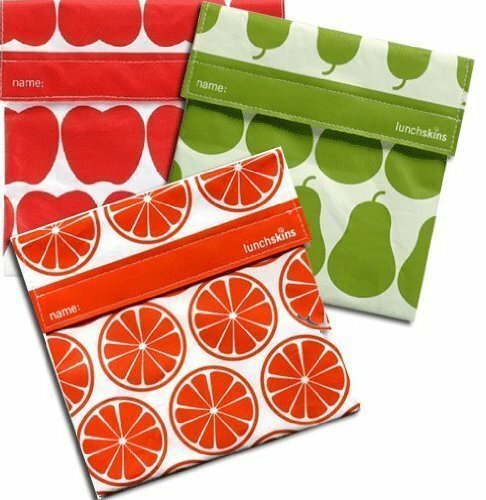 If you are looking for the best non-toxic, eco-responsible lunch gear all in one place, you've found it! To make it even easier to shop, I have links below so you can buy the items on Amazon! 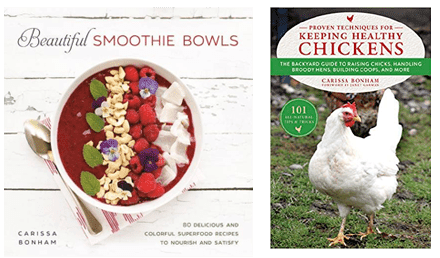 If you aren't already an Amazon Prime member, Amazon is offering a Free 30 day trial for Amazon Prime for Creative Green Living readers. It includes free 2-day shipping. Click the banner below to sign up for a FREE 30 day trial of Amazon Prime and get all your last minute shopping done online - with free shipping! 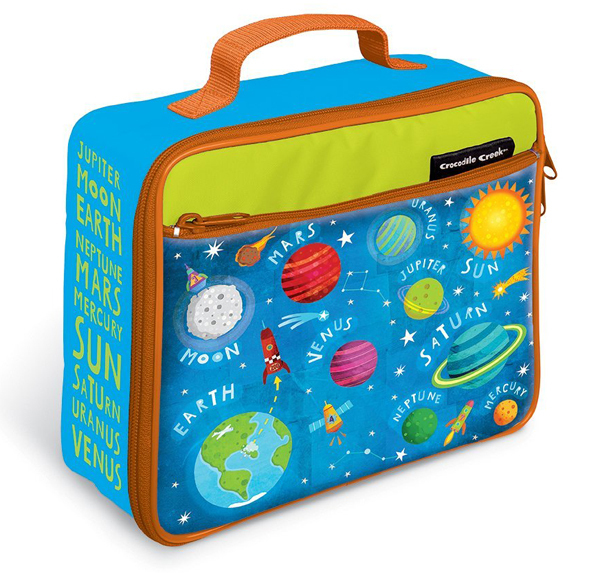 Our lunchbox from Crocodile Creek is not only free of sketchy ingredients like phthalates, microban, PVC and lead (lead is a surprisingly common ingredient in the liners of lunchboxes!) - but it's super durable. Our Crocodile Creek lunchbox has been used and not always treated very nicely for four years now and is still going strong! The inside is easy to wipe out and is roomy enough to fit all the essentials and an ice pack if needed. Our everyday workhorse of a bento box is from Lunchbots. Lunchbots boxes come in a few different sizes and divisions - from one big box (called the Uno) to as many as 5 spaces (called the Cinco). They are made out of stainless steel so are both nearly indestructible and dishwasher safe. 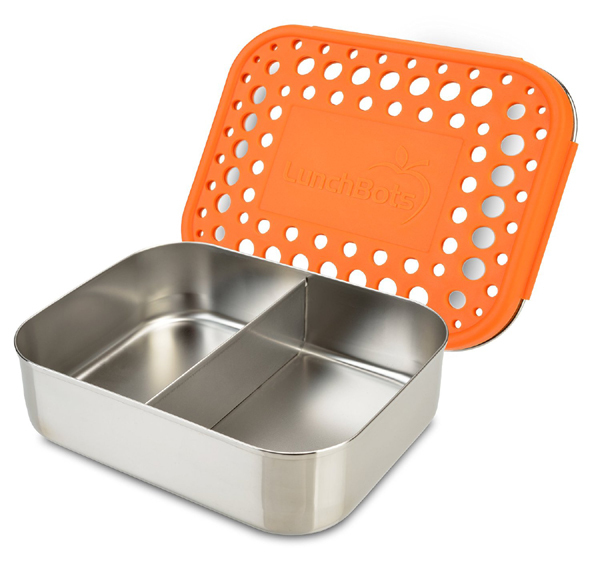 It's important to note that Lunchbots boxes are not leakproof, so they are best for dry foods like sandwiches, veggies or any of the bentobox lunch combos I suggest here. 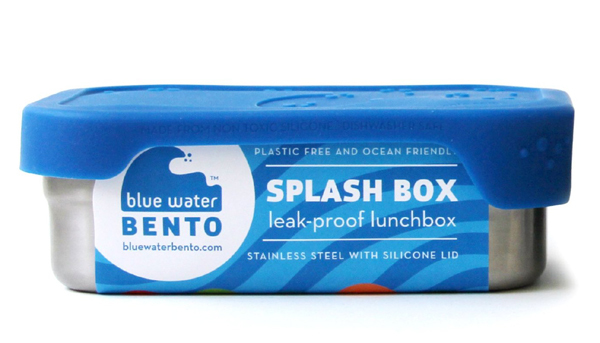 If you need a leakproof box, the Splash Box from ECOlunchbox is another great choice. The lid is made from silicone - not plastic - and is easy for kids to grip to open. This is a great choice for packing wet food like orange slices or fruit salads or even just whole sandwiches. They come in a three cup (shown) or one cup capacity - both of which are waterproof, leakproof and dishwasher safe. 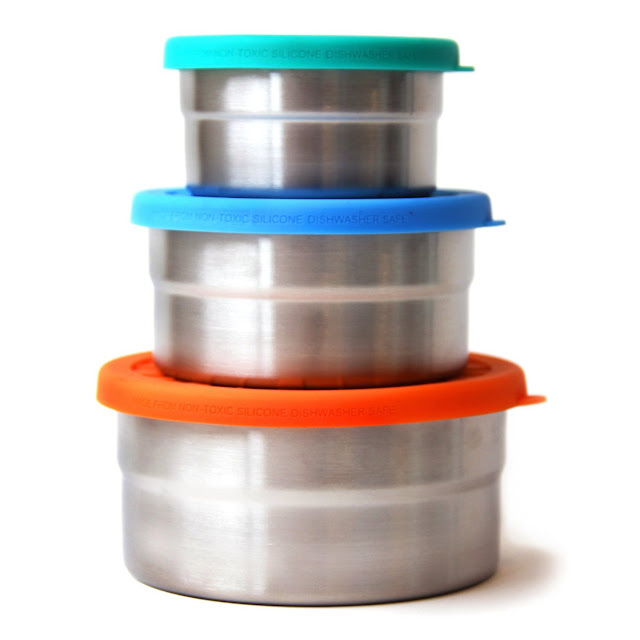 My choice for round bento containers for sauces and dips, etc are these nesting boxes from ECOlunchbox. The lids are plastic-free silicone and they are sketchy ingredient free. These boxes are leak-proof so they are good for packing sauces and juicy items. 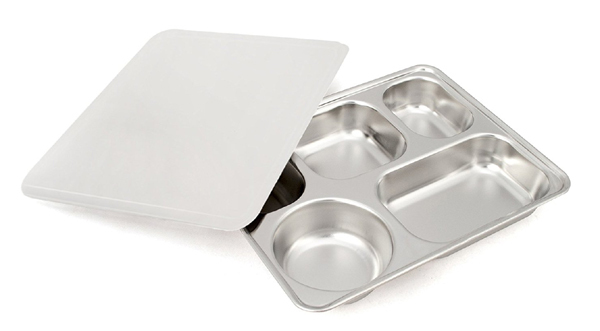 When lunchables became all the rage with the first graders at my son's school last year, we picked up this five compartment stainless steel lunch box for him to take instead. The only downside to this one is that the lid is made of plastic. However, because the food is generally sitting in the compartments and not on the lid, we decided we were ok with it. 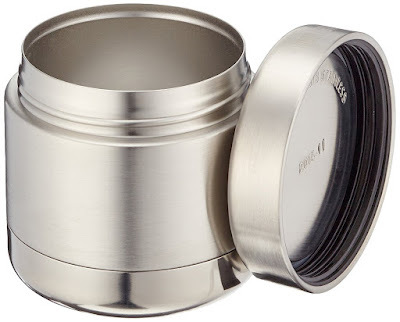 Aspire does make a version of this with a stainless steel lid but I have not tried it myself to be able to vouch for it. For keeping food hot of cold, I think the Klean Kaneen insulated jars (available in 8oz and 16oz sizes) are awesome. It keeps food hot for about 3 hours but cold for closer to 6 so it's perfect for bringing yogurt or even ice cream without having to mess with an ice pack. If you want to bring more than 8 ounces of a hot or cold dish - like soup or a smoothie with you - the Klean Kanteen insulated water bottles out perform the small insulated containers (I think this is because the lid on the water bottle is better insulated than the small container lid). If I put ice water in mine, 24 hours later it will still have ice cubes floating in it! On the flip side, it keeps hot items like tea, coffee and soup hot for about 6 hours. 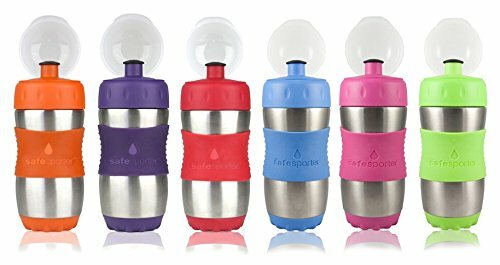 For basic, non-insulated water bottles with a sport lid, the Kid Basix Safe Sporter is my favorite (they also have a great straw/sippy cup for toddlers!). 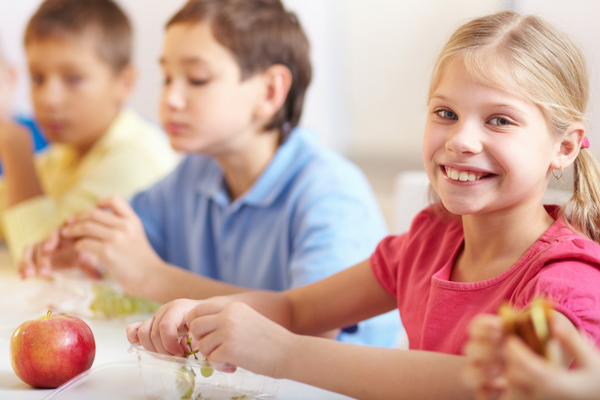 All of their products are lead, cadmium and phthalate free. I love that the silicone band in the middle makes it easy to hold on to as well. If pretty pictures and characters are more your style, Crocodile Creek makes cute uninsulated stainless steel water bottles. This is what my oldest was using before we moved to the Safe Sporter (above). 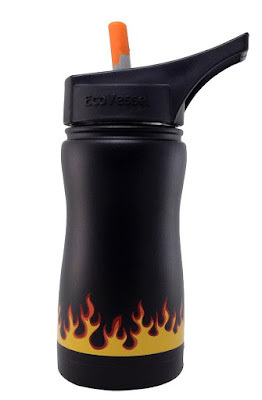 If your kids prefer an insulated bottle with a straw, we like the EcoVessel Frost bottle. The insulation is great and will keep your ice from melting all day long. When the straw top is closed all the way, it is leak proof. Just practice with your kids to make sure they know how to close it all the way - because if it is only a little closed, it will leak. 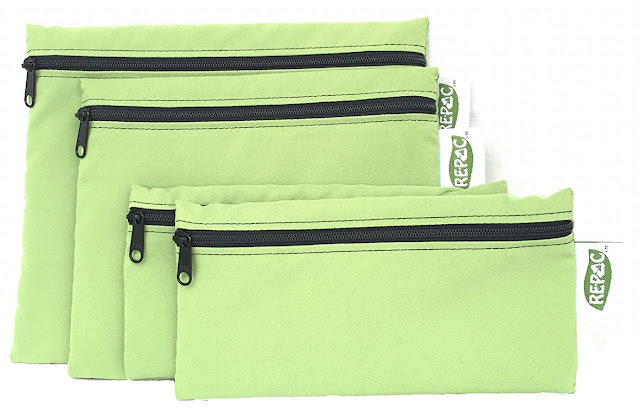 For sandwiches and dry snacks, we like Re-Pac Bags. These are made in the USA are phthalate and PVC free. To wash them, just flip them inside out and stand it up in the dishwasher or pop it in the washing machine. Note that these bags are not ideal for wet foods. Made from the same material as professional frosting/pastry bags, these cute bags from LunchSkins another great re-usable bag option. Wash them in your dishwasher and allow to air dry. If you need something waterproof or you want to pop something in the freezer for later, these silicone bags from Stasher are great. I personally like to just bring a normal metal fork or spoon from home in my lunchbox but you have a kiddo (or spouse?) 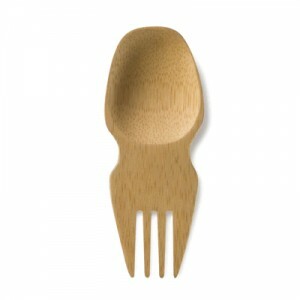 who isn't responsible enough to make sure their silverware gets home, these tiny bamboo sporks from Bambu are great. I wash them to reuse them (if they do make it home) but if it gets lost, it's not a big deal and I can just pop another one into his lunchbox the next day. How to Paint a Ceiling - tips to do it the fastest, easiest way!